Apartamento exclusivo ecológica em 26º andar com vista espetacular de Santiago e da Cordilheira dos Andes. Ele tem 2 quartos grandes, confortáveis ​​e luminosos, dois banheiros, varanda, conexão wi-fi gratuito. Ele também tem duas piscinas e jardins interior e ginásio. Sua localização privilegiada e alta conectividade, pode facilmente caminhar ao redor da cidade velha de Santiago, tendo muito próxima praça principal, palácio do governo, sectores como o bairro boêmio Bellavista. É passos da estação de metro de Santa Lucia e principal avenida de Santiago, Alameda / Avenida Libertador Bernardo O'Higgins. LOCAL SUPER AGRADÁVEL PARA QUATRO PESSOAS, PRÓXIMO A TODAS AS ATRAÇÕES DE SANTIAGO E COM UMA VISTA LINDA DO APARTAMENTO. Andar alto com uma vista deslumbrante da cidade. Tivemos o prazer de ficar neste belo apartamento, no 26º andar, eu e minha família, com 4 pessoas, em um predio novo, situado no centro de Santiago e bem próximo da Estação de Metrô, Santa Lúcia e demais atrações, facilitando assim o nosso deslocamento pela cidade. Na época em que estivemos, na primeira quinzena de Janeiro, fazia um forte calor na cidade, o que trazia certo desconforto para dormir, pois o imóvel não dispõe de ar condicionado e nem tampouco ventiladores. Sugiro ao proprietário, Sr. Francisco, que nos recebeu muito bem, se puder, providenciar algo assim para melhorar o conforto de seus hóspedes, assim como um varal de piso, para que se possa pendurar roupas molhadas, tais como toalhas, etc. Loved the view, the space, the closeness to the metro. The apartment building residents always said hello. I really felt like it was a home. Great location and owner hospitality! We were a family of 4 that stayed in this apartment for 4 nights. We enjoyed the central location and being on the top floor of a secure building. The apartment was small but adequate for our needs. It was clean and modern and had the amenities as stated on the website. The view of Santiago and the Andes mountains and the city lights at night from the balcony were amazing! We did hear some street noise (that is to be expected in the middle of a large city) but we never heard any noise coming from any of the neighbors. There is a grocery store directly across the street from the building entrance which we went to daily. We cooked two evening meals in the apartment and breakfast each morning. Our stay began and ended with Francisco, the owner, transporting us to and from the airport (for a separate fee that was comparable to the fee charged by a taxi) and made that part of our trip stress-free. Thank you, Francisco, for being such a good host! The owner was very accomodating but the apartment needs a little work. 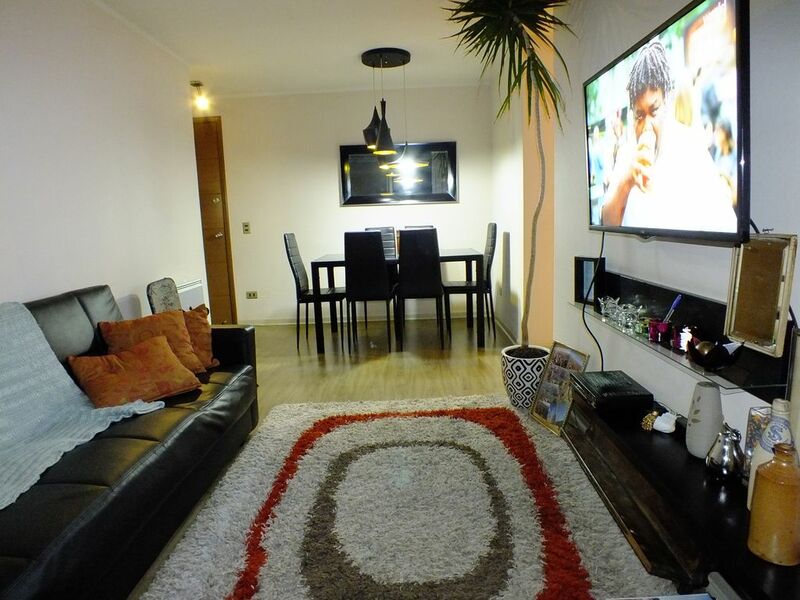 The owner is very good to work and this apartment is in a good location. However, any time we tried to use the oven and the burners at the same time the breakers would pop. Also the white towels looked very old and grey. Only a couple outlets worked and the pots and pans were very old. Perfect for two adults and two kids. Just as others have written, the location is very local. Big market across the street. We ate breakfast and a couple dinners in the apartment. Our kids, 5 and 8, slept in the one room and us in the other. Awesome city view. We didn't get a chance to use the pool but it looked very nice. We also slept with the windows open each night. Perfect in March. Francisco arranged parking, so everything went very smooth. I would recommend. O apartamento está localizado em frente ao Monte de Santa Lucia, a poucos passos da Biblioteca Nacional. Ele está a 10 minutos a pé da Torre Entel e da Universidade Católica e da Universidade do Chile. Além disso, fica a 20 minutos a pé bairro boêmio de Santiago Barrio Bellavista, Lastarria, o centro histórico com a sua praça principal, museus e pontos turísticos e de negócios de. Tarifa no reembolsable / o por cancelación Nota IMPORTANTE: En caso de generar algún daño en el apartamento o sus bienes, estos deben ser reparados antes del día del Check Out o en caso contrario pagar su valor equivalente a un articulo nuevo. IMPORTANT NOTE: In case of generating any damage to the apartment or its assets, these must be repaired before the Check-Out day or otherwise pay its equivalent value to a new item.